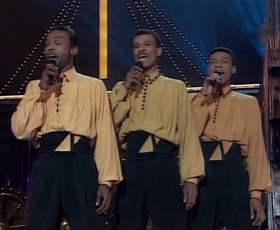 The Eurovision Song Contest 1992 was the 37th Eurovision Song Contest and was held on May 9 1992 in Malmö, Sweden. The presenters were Lydia Cappolicchio and Harald Treutiger. Linda Martin, representing Ireland, was the winner of this Eurovision with the song Why Me?. The song was written by Johnny Logan, who had won the 1980 contest as singer and the 1987 contest as singer/songwriter. The contest took place at the indoor ice arena of Malmö where the stage set was in the shape of a Viking ship's bow with a dragon in the centre and stars on each side. The opening sequence included women dressed in the Swedish colours of yellow and blue and twirling ribbons. The filmic postcard tradition was continued with clips based on each country. Last year's winner, Carola, appeared on stage in a white dress with sheer sleeves, a rhinestone collar and cuffs and sang All the reasons to live. This contest marked the last participation of the dismembering Yugoslavia which soon separated into independent nations, some of which attempted to participate in the 1993 contest.This year's final entry was chosen as the last representative for SFRY even though the participants in the local contest were only from a portion of its former lands. 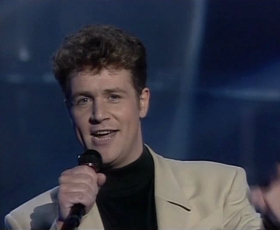 After scoring second place consecutively (1988, 1989) and scoring some disappointing results (1990, 1991), the United Kingdom sent Michael Ball with the contemporary pop-song One Step Out Of Time, which was the hot favourite to win the contest. However, the Irish sent Linda Martin, who had the past experience of coming in 2nd place in the 1984 contest, but also paired up once again with Johnny Logan, who won the contest twice before. In the end, Ireland won the contest with a 16 point lead over the United Kingdom, starting the chain of Irish wins in the 1990s. Malta with Little Child, performed by Mary Spiteri, also scored very well coming in 3rd place with 123 points. This was the first time that the three highest-placed songs had all been in English. Sweden, the host country, finished 2nd last. Switzerland had to replace its original choice of entry, Soleil, soleil which was to have been performed by Géraldine Olivier. The song did not comply with some of the rules of the national selection contest and so, despite having won, it did not go to Malmö. Four artists and one band returned to the contest this year. 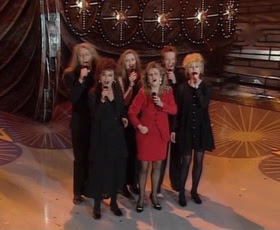 The German band Wind represented Germany in 1985 and 1987, Grétar Örvarsson and Sigga, members of Heart 2 Heart, represented Iceland in 1990 as members of the band Stjórnin, Linda Martin represented Ireland in 1984 and Mia Martini performed for Italy in 1977.